This movie was typical Tarantino, filled to the brim with awesomeness. When I think of a western, I think of the standoffs and all of the elaborate plot twists that come from a time when literally the smartest and toughest person wins the gun battle. This movie was with no shortage of surprises or lines and held up it's end of the deal. I want to say first and foremost that seeing it in 70 mm film format was a pretty dope thing; Quentin Tarantino out did himself on this one. With the experimentation in the Western Film genre with Django Unchained, Tarantino comes back around this time with a more sophisticated, yet gory film that holds true to his filming style. And what he gave us was a master piece. I speak so highly of this movie for the simple fact that not enough movies these days blend a well placed plot, awesome story from the whole cast and the special effects were on point. 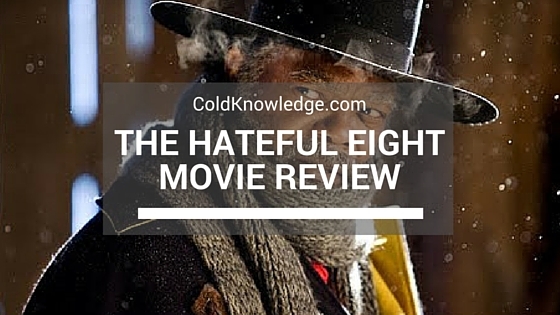 In Django you saw blood and gore like no other, but in the Hateful Eight Tarantino simmered down on that aspect and relied on timely placed gore instead. That change in directing setup, in my opinion, great shots for when there was a need for gore. I especially liked the touch of special effects where Sam Jack was drinking scolding hot coffee and the steam went from his cup to all the way around the brim of his hat and up to the roof. That part of the movie was so awesome, simple and a nice touch of directing from Tarantino. Channing Tatum's brief appearance adds immense value due to his particular role. It was particualry good to see Madsen as he's one of my favorite actors from back in the day. Each character nails their role in stride on way to serving the main purpose of the film. I'm not trying to give too much away with this film because I want people to go out and support it, just know that it's worth it. And with a run time of 3 hours, there's enough in there to keep you glued to the screen, waiting on the next turn of events. I give this movie a strong A and I'm looking forward to when it comes out on Blu-ray so I can support it and watch it multiple times over. This movie embodies what westerns are, but it also does a good job at keep the people who aren't fans of the genre enthralled in the movie. I recommend this movie while it's in theaters. If you've seen this movie, then I would like to hear what you have to say. Make sure to leave your comments below.